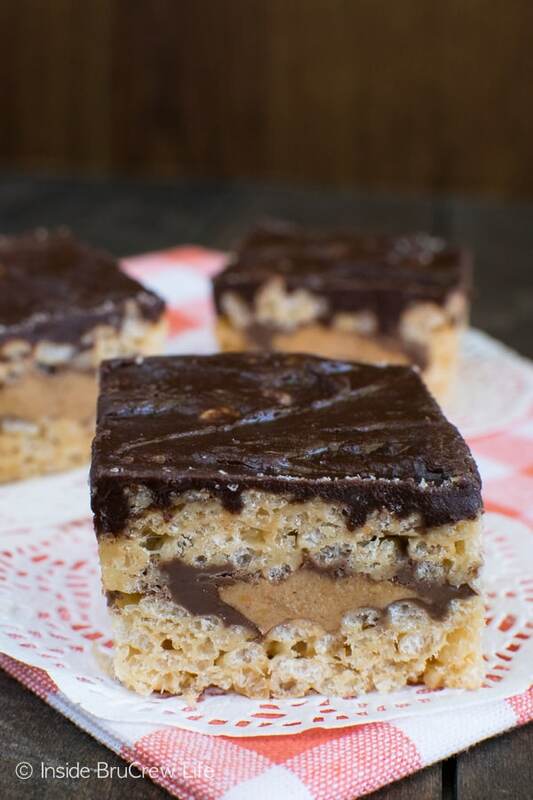 A layer of candy bars and chocolate make these Peanut Butter Cup Rice Krispie Treats the best no bake treats you will ever have. These will not last long when you bring them to picnics or barbecues. Most days I have crazy baking ideas that I can’t wait to get in the kitchen and work on. 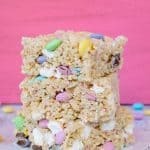 Then there are days when I just want to make quick and easy desserts like rice krispie treats for our kids to enjoy. The problem is I am me. I can’t stop my crazy mind from wandering when it comes to easy desserts. Well, I can’t keep it from wandering on any kind of dessert really. I really did have plans this time to make a pan of the best rice krispie treats. But as I pulled out the cereal from the bottom cupboard, I glanced over to the other side where I keep the “off-limits” food. Yes, I do hear candy voices! That’s not weird, is it? How in the world was I supposed to resist candy that was basically forcing itself on me? I just couldn’t. I started to think back to these Candy Bar Stuffed Rice Krispie Treats. I remembered how good the layer of candy bars was inside the no bake treats. That did it! All thoughts of original Rice Krispies treats went out the window. The peanut butter cups won me over with their sweet yells. So, my pan of easy treats became rice krispie treats with peanut butter and marshmallow. That doesn’t surprise you, does it? Butter your pan before you get started and keep the butter out. I like to butter my hands because it keeps the mixture from sticking to me. You could also use wax paper or parchment paper, if you don’t want to get messy. Unwrap all the Reese’s peanut butter cups and set them aside. Buy a few extra because you know you are going to pop one or two in your mouth as you do this step. Stir a little bit of peanut butter into the melted butter and marshmallow to give these bars the full peanut butter experience. You do have to work quickly as you put these together. Do not let the mixture sit long at all, or it will start to cool and be harder to work with. Divide your hot rice krispie treat mixture in half. Press one half into the buttered baking dish. Lay the unwrapped Reese’s peanut butter cups over the top. As soon as the candy bars are down, press the rest of the mixture over the top. Make sure you get it as even as possible. But don’t stress too much about it because we are adding a layer of chocolate over the top too. That will hide the imperfections. Try not to press the rice krispie treats too much. Pressing the mixture too hard into the pan is what causes hard rice krispie treats. I don’t know about you, but I prefer soft, chewy rice krispie treats. 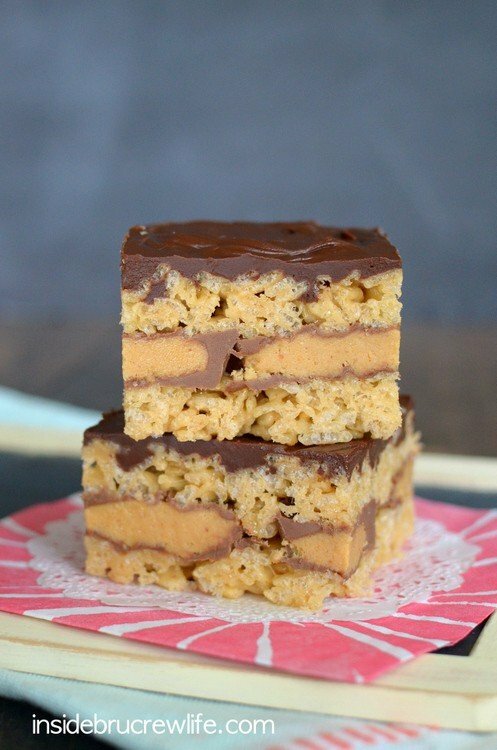 The last step to these Peanut Butter Cup Rice Krispie Treats is a layer of chocolate. Combine the chocolate chips and heavy cream in a saucepan over medium heat to melt it or place it in a microwave safe bowl and heat it for 30 seconds. Stir until it is spreadable. If you need to heat it another 10-15 seconds, go ahead. Just do not over heat the chocolate. Let the chocolate set before cutting into bars. That is if you can wait that long. I suggest earplugs while you wait to block out the yells from the peanut butter cups. Seriously! It’s a real thing! 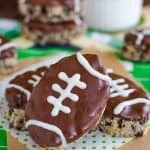 A chocolate and candy layer make these Monster Cookie No Bake Bars a fun treat that everyone will grab. Make this Sweet and Salty Trail Mix to munch on for long drives or movie nights. Chocolate Peanut Butter Granola Bars are a great snack for on the go breakfasts or after school snacks. 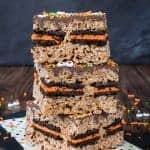 A layer of candy bars and chocolate make these Peanut Butter Cup Rice Krispie Treats the best no bake treats you will ever have. Butter or spray a 9x13 pan and set aside. Melt the butter over low heat in a saucepan. Add the marshmallows and stir until completely melted. Stir in the peanut butter. Pour the cereal into the marshmallow mixture and stir until completely combined. Press half the cereal mixture into the prepared pan quickly. Place the 24 peanut butter cups over the top of the rice krispies in the pan. Spoon the rest of the Rice Krispies mixture over the top and press down. Let cool completely. Place the chocolate chips and heavy cream in a saucepan and heat over low to medium heat until melted. Stir until creamy. Spread over the top of the Rice Krispie treats. Let set. Cut into 24 squares. Store in a sealed container on the counter. *To make these easier, make 1/2 a batch of the Rice Krispie mixture and press it in the pan first. After adding the peanut butter cups, make the second 1/2 of the Rice Krispie mixture and press it on top. *This post and recipe was originally posted July 23, 2014. **This post may contain affiliate links. By clicking on these links or purchasing recommended items, I may receive a small compensation. I will only recommend products I use and love. Thank you for supporting Inside BruCrew Life. With that layer of PB cup, I’m practically running to the store for ingredients. I love it! Thinking of ways to use chocolate is a fabulous problem to have! It definitely is a fabulous problem! 😉 Thanks Mir! 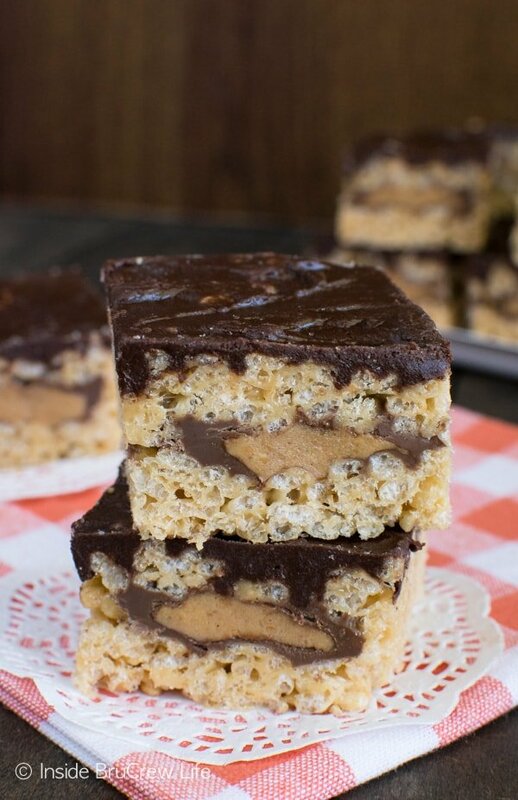 Have you tried not mixing the top layer of krispies treats until after you put down the peanut butter cups? Hi, Lisa. No, I just make the rice krispie mixture all at once, press half in quickly, top with the peanut butter cups, and then press the other half on top. As long as you keep moving and have everything ready to go, the mixture shouldn’t harden for you. I just made them (haven’t cut into them yet!) and i did it in two batches so the top one didn’t cool too fast to work with. worked out great. That is how I would do it make the Rice krispy treats in 2 batches…..I have a question though are these the mini peanut buttwe cus o the full size ones ? You can do it in two batches if it is easier for you. I didn’t have any problem dividing the krispies and doing it all at once though. These look amazing. I think I would use Trader Joe’s dark chocolate peanut butter cups. And maybe even make chocolate Rice Krispie treats. There can never been too much chocolate, right? I will definitely be making these. Are these gluten free? If not, do you have any suggestions? No these are not gluten free because the Kellogg’s Rice Krispies cereal is not gluten free. You could substitute any gluten free rice cereal that you like though. I do not calculate the calories in my recipes. I believe in exercising and eating a few sweets in moderation. There are websites with calorie counters that you can copy and paste the recipe into if you really want to know. Although…did you look at the recipe? It is loaded with butter, marshmallow, peanut butter, and candy bars. Pretty sure you are better off not knowing. LOL! I wouldn’t be able to stop eating these, amazing!! The peanut butter cup surprise in the middle is SO COOL!! These look like the best rice krispies ever, Jocelyn! I am loving the Reese’s in the middle. Pure peanut butter bliss! Pinned! Oh my gosh! These look just amazing!!! I don’t think I’d be able to control myself around these. Peanut butter cups are my favorite candies! Mixing them into a rice crispy treat was definitely necessary! PB cups stuffed inside rice krispie treats?? Jocelyn, you are brilliant!! And this would be the only way where I wouldn’t have to share any RKT with my guy… Although they’re basically the only dessert he’ll devour in seconds flat, he hates PB. (Crazy, right?) But if any of your kids threw a fit about having PB cups inside their plain rice krispie treats… May I have their share? 😉 Pinning for sure — and maybe making my own in the future, thanks to you!! Oh my goodness, I love anything with Reese’s!! Those have to be the best rice krispie treats ever! WOW!!!! That beautiful layer of Reese’s cups is just absolutely breathtaking! I can’t wait to try these. Oh heck yea!! I want to take a big bite out of these! When I first started blogging, you reassured me when I wondered if waking up in the middle of the night with cookie ideas was a sign of insanity. (For the record, you said it was not . 🙂 ) Now I find myself reassured that the voices I hear coming from my baking supplies cabinet are only my extra bags of Reeses cups calling out to be used in these peanutty bars! They look great! What size pan did you use? 9×13? Thank you. Yes, I used a buttered 9×13 pan. It is in the recipe directions. Was it not noticeable? Maybe I should move it to the top of the directions? Such great rice crispy tips! I love this version! These look fantastic. Rice Krispie treats win a prize in my book for being easy to make, but I don’t necessarily like the plain ones. Now add peanut butter and chocolate and I won’t be able to stop eating them! Candy talks to me too! Glad I’m not alone 😉 I love peanut butter and chocolate in anything, but am loving it in these krispie treats! Oh how I love these krispie treats. Oh I love ALL krispie treats. Yes, I definitely need these in my life! We’ve long loved Peanut Butter Rice Krispy Treats. This takes it to an all new level though! 🙂 Gonna have to try them! No, it’s not weird to hear candy voices~things speak to me too! So much peanut butter goodness in one recipe. Love these! Pinned. I love PB and marshmallow together (hello fluffernutters!) so the fact that you just added chocolate too makes these impossible to resist! Stuffed rice krispie treats?! These are amazing! Oh my worrrrd! That layer of PB looks sooooo good! It dosen’t get much more perfect than this! There’s nothing better than a Rice Krispie Treat except a Rice Krispie Treat with peanut butter cups! Love this. These look insane! Your squares and layers look so perfect. I’ve never been good at packing my rice krispie treats down because they’re so sticky. I need practice, I guess, and I should start here — these look delicious! You just keep finding ways to out due yourself! These look awesome! 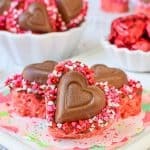 These sound great but where I live the regular size PB Cups are a pack of 2 for $1.00 so I’d need $12.00 worth of candy to make these. Not going to happen in my kitchen. What will happen is the addition of peanut butter to the treats and the peanut butter/chocolate topping. Thanks for this idea. 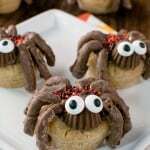 I might have some Reeses minis left this Holloween that |I could scatter over the top. so just some bites had the candy. Mmmm. I’m house-bound so I can’t get to the stores but I do have a good recipe for the PB cup filling. Wonderful idea to spread a layer of that inside the treats. Thanks! I’m going to try this. You could do the mini peanut butter cups if you like. And yes, freeze them first because the warm mixture will melt them pretty quickly. The small ones just won’t have the impact as the big ones do! These are totallly call my name right now! You can buy 6 recee candies at the Dollar General for 1.00 a total cost of 24 for 4.00. Wow love these Rice Krispie treats. So did my three sons. I just had a problem with the butter and chocolate. It seized twice in microwave. It was upsetting. I followed the instructions. What did I do wrong? Help. Can I melt the chocolate over a double boiler? If so should I add the butter to it? This is how I melt chocolate for some recipes. I’m so glad your family enjoyed the rice krispies. The chocolate might have been heated too long if it was seizing. You can also melt it slowly in a pan or double boiler too. 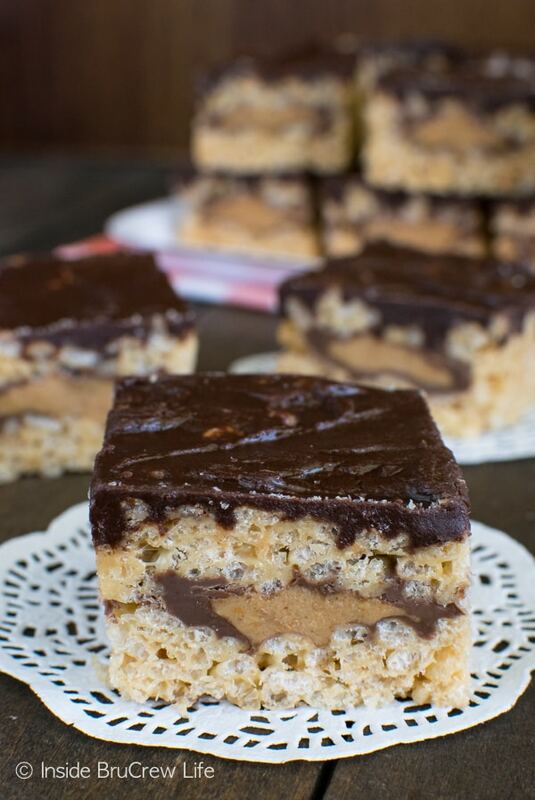 We saw your PEANUT BUTTER CUP RICE KRISPIES TREATS on a FB post from a dear life-long friend (Rosalie Green) that keeps trying to make me even more fat with all these recipes. Anyway …we make sauce (many different types) and have a business in Central Virginia and would love to let you try our sweet and hot raspberry hot sauce in hopes of your using and purchasing the product. You or your hubby can contact me any time on my cell phone if you’d like. Can you tell me, please how many boxes of Rice Krispies it takes to get 7 C., and how many bags of mini marshmallows to get 7 C.??? One big box of Rice Krispies and big bag of mini marshmallows will give you plenty. I hope you enjoy the treats! If you click the print button on the recipe card, it will open a recipe card that you can print. Do you use full size reeses peanut butter cups or bite size? I used the full sized Reese’s in mine, but you can use whatever size you like. I hope you enjoy the treats!!! These are nothing less than incredible! Made them for a family supper and everyone could not get enough of them. So nice to have a recipe that is different from the usual. 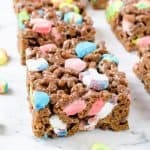 I did find the mixing of the rice krispies into the marshmallow challenging and as I was doing it – I was thinking that I would not be making these again. Well, that was until I and my family tasted them. The extra work will not even be noticed because of how great these taste. I am so glad you found that they are worth the work 🙂 They are a favorite here too! Wow, these look delicious! Must try!! I finally had the opportunity to make these as part of the dessert spread at my daughter’s birthday party. They were worth the wait and so good! In fact, I made them 3 days later for a work function and they were the first item gone! Woo hoo! That is awesome to hear 🙂 !!!! Can these be prepared and frozen? I have never frozen rice krispie treats before, so I googled it. It looks like if you wrap them well enough, you can freeze them. Just set them out a few hours before you want to serve them. Let me know how it works for you. I love this idea! Thank you for sharing. Rice crispies with pea nut butter!! What a fun treat! hey girl- these treats look amazing! I made these bars for a kids treat but I used a 9 x 9 pan and There was plenty of Rice Krispie mixture for both layers. I used half the ingredients for the bottom layer and placed peanut cups on top. Then I made the other half of the Krispie layer for the top–didn’t have to worry about working fast. Added chocolate top. I cut the bars into small squares – still looked pretty. Let’s face it, these bars are very sweet and have a lot of sugar/fat so a smaller portion is probably a good idea. Question, could you leave off the top layer of chocolate? I know I must sound crazy. A co-worker made these and they were so yummy, but so rich…so thought maybe leaving the top layer off might help. These look awesome! Can I use organic peanut butter instead of the creamy store bought one? Will it hold shape? I’m not really sure because I just used the store bought. I think with all the marshmallows that it would be ok, but I can’t say for sure. Keep me posted if you try it that way! I’m in the middle of making these, and just realized I don’t have heavy cream! I’ve made these many times before, and I forgot I needed that for the top layer. Can I make it without the heavy cream, or substitute it with milk?? I would just use the chocolate and add some shortening or coconut oil to thin it out. Or if you have coffee creamer, you can use that in place of the heavy cream. These rice krispies were a huge hit in our house! They were gone in minutes! I am totally about anything NO Bake and anything chocolate and peanut butter!!! This is the best rice krispie treat ever!!! No way… these are HEAVENLY!!!!! 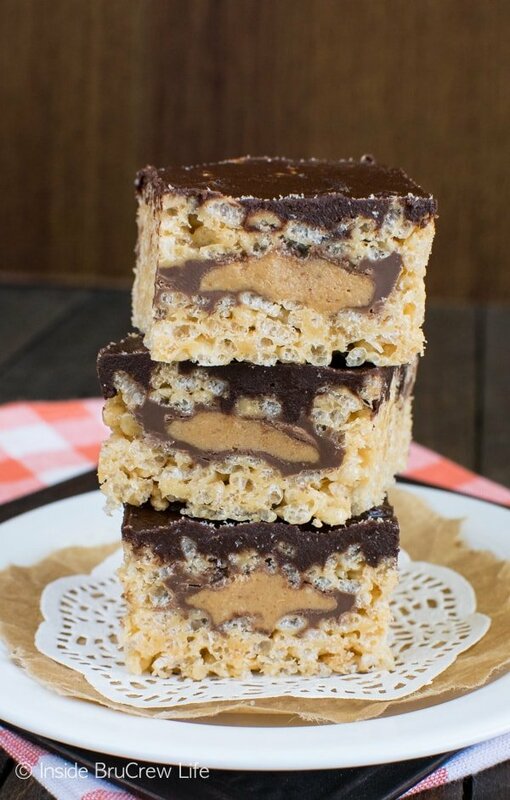 Peanut butter, chocolate AND rice krispie treats? GET IN MY BELLY!